With a day job as a nanny in Chicago, Vivian Maier (1926–2009) was a photographer unknown by the art world throughout her life. After encountering her works by chance at an auction in 2007, when he bought a selection of them in a large sealed box, John Maloof began collecting her prints, negatives, and rolls of film. 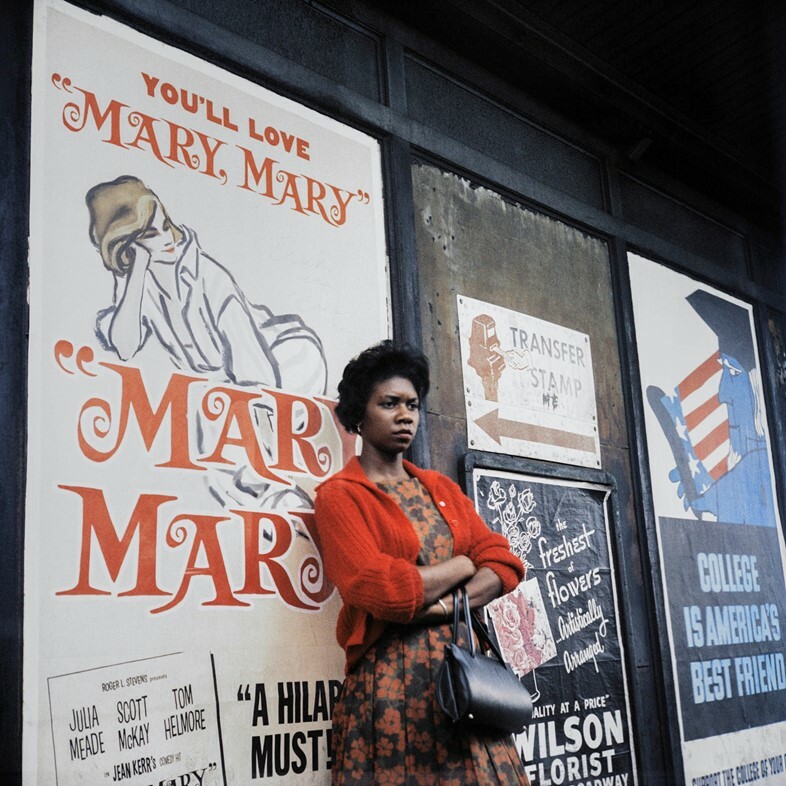 The first photographs that Maloof shared online went viral, and he followed this with a documentary, Finding Vivian Maier (2015), which was nominated for an Academy Award. As a result, Maier is now best known for her monochrome works, small square-formatted images of street life that have seen her compared to the likes of Lee Friedlander and Lisette Model. However, what Maloof largely left out of his documentary were the 700 rolls of colour film that he had yet to develop, and the 40,000 Ekachrome colour slides Maier left behind, mainly from the last three decades of her life. Now a selection of these colour works are on show for the first time. The exhibition in Maier’s birthplace, New York, presents an impressive array of her street photography capturing the people of New York and Chicago from the 1950s all the way to the 1980s. There’s a gentle deliberation in these images; punctuations of colour are situated in compositions with careful precision: the pop of red from an American flag, a woman’s lipstick, a two-piece suit. 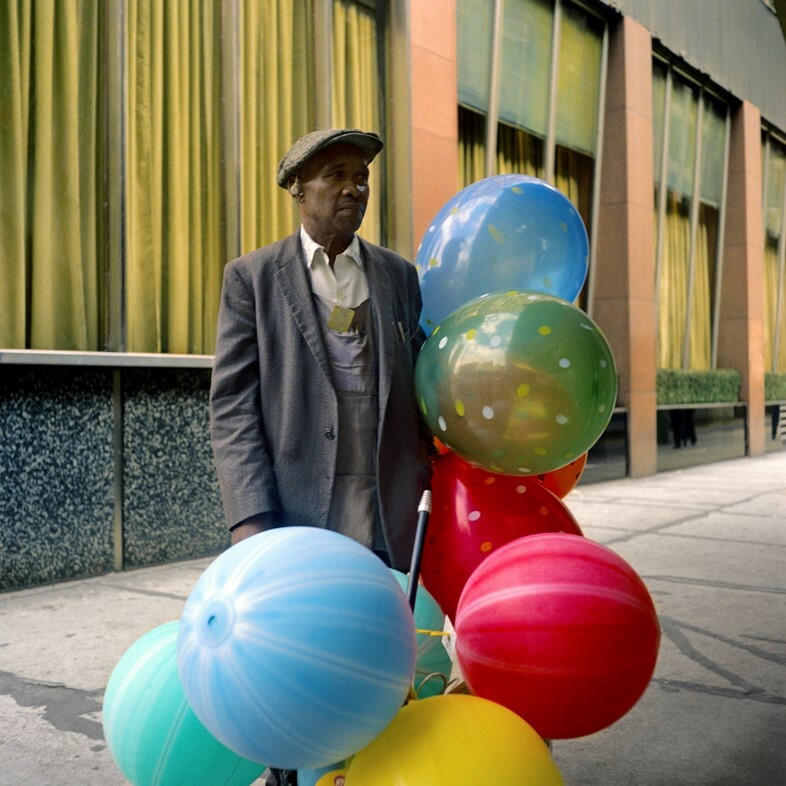 A suited man sells balloons swollen with colour: vibrant red, deep green, resplendent turquoise. Maier’s attention is caught by these colour connections, with her camera she makes us examine the cohesiveness of her collected images, the way lives intersect even if it’s simply through colours shared. The way one man’s vivid lemon socks match the palette of a woman’s knee-length skirt, or a child’s sweater pleasingly pairs with the awnings of a shopfront as he cries in adult arms. A snapshot of woman’s white skirt and flowered shopping bag holds within it a shock of yellow and orange marigolds. In another photo we see what looks like the same bunch of flowers, laid on the ground in the shadow of a streetlamp on what is most probably the same sunny day; a square of mirror is balanced on the stems. This mirror is transformed to a frame in the picture, its reflective surface spits back at us a sliver of blue sky, a curl of brown hair, a cheekbone; it contains within it a rare glimpse of the artist herself. Although increased in number, Maier’s colour self-portraits work with the tropes of her monochrome beginnings. Self-exposure is never simple. In earlier works she appears solely through her shadow, and in these colour shots too we are greeted by the same spectre, whether cast on the speckled grey of flagstones or the vibrant green of a flowering lawn, it still plays a striking role. Yet the shadow’s darkness is somehow lighter in a world where its severity is an anomaly. These colour pictures map a crucial transformation, not only in style, but in their creator. Maier is best known for her work with her famous Rolleiflex camera, the machine that enabled her to remain concealed from her subject, its mirrored lens held by her stomach. In the years before colour, Maier was never once required to look her subject in the eye. With coloured film comes a modern 35-millimetre camera, a device that Maier had to lift to eye-level in order to focus and take her shots. So colour not only reveals the vivid hues of the world around Maier, it also reveals her to the world in which she was working. With this first compendium of colour images two shifts present themselves: a woman who now wishes to use the colours of the world, but also a woman who is no longer afraid to be seen – a woman who finally feels her place within the great audience of colour. 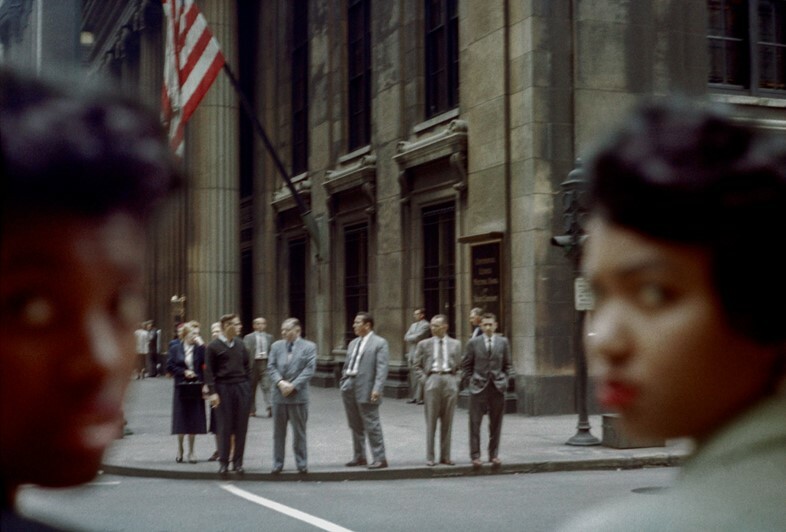 Vivian Maier: The Colour Work is at Howard Greenberg Gallery, New York until March 2, 2019.